We illustrated how we could use color and shape to understand the structure of our data. What is nice about visualizations is that they can be meaningful across many data sets. In periods of financial stress a highly researched phenomenon is contagion. To put it simply this means everyone doing the same thing at the same time – or in other words increased average correlations. Average correlations is the concept of averaging each component relationship to another component in your population universe. So how can we visualize this? Again… via. heatmaps and 3d charts. The following visualizations explore the DOW30 average correlations back to 2011 – the conclusion we can make is that… there is no contagion… yet. Also, why DOW30? It’s because this takes a f*&king long time to run – it is much more feasible than running the SP500. So how do you interpret these charts? Our Y axis is the correlation lookbacks which span between 10 days and 190 days..
Our X axis is time. 0 trading days (far left) starts in January 2011 – and spans to present 2000 trading days later. Deep red indicates contagion ie. seen clearly in 2011. Deep purple indicates the exact opposite (what we saw in 2017). Green is the 40%-50% average correlation range where we stand now. All this means is that there is no significant contagion – yet. Our risk model remains in pure risk off. 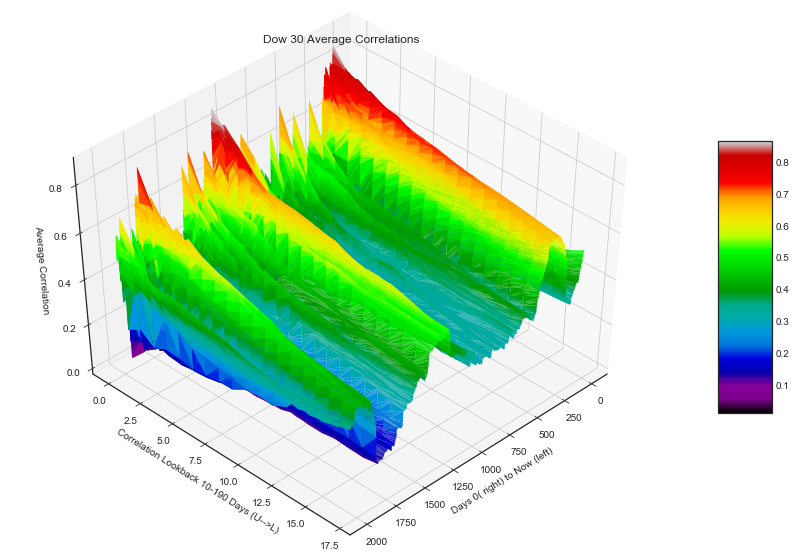 In our second chart we present average correlations via colour and shape – a 3d chart. Presenting both visualizations can help if one or the other isn’t immediately intuitive. The second chart is labelled appropriately – but if you have any questions, feel free to ask. Gotta run, the market is about to open! – but which visualization makes more sense to you? 3D is more intuitive for me. The look back axis is for 10 to 190 days, how do you relate it back to the scale of 0 to 17.5. 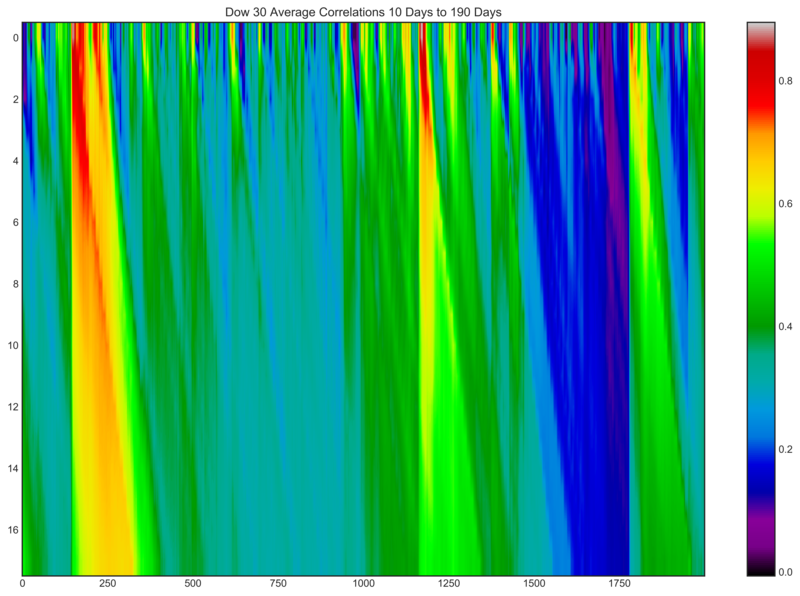 I am assuming 0 on look back axis represents 10 days. yes that’s correct – working on proper labels. I like the 3D better also – since it is after all, a 3D data set. It makes it much easier to see trend in the data. I appreciate the RoY G. Biv scheme – but especially on the 2D graphic – I find the violet a little too close in “temperament” to the red. I’d rather just see the range go from Red to Dark Blue.